New Orleans at Atlanta - I don’t remember a time when I have liked a team with a record this good as little as I like the Falcons. They keep winning, but they just don’t look great doing it. 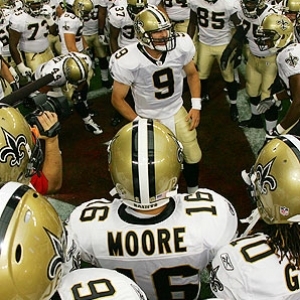 The Saints suffered a setback last week, but they were against the best team in the NFC so they had an excuse. They should bounce back well here. Take the Saints. Seattle at Chicago - The Seahawks have some serious distractions this week thanks to the positive drug tests in their defensive backfield. Thanks to appeals the players should be available, but the damage should still be done. That combined with a defense at home that should make things tough for the Seattle offense, and the pick is clear. Take the Bears. Minnesota at Green Bay - I really didn’t like the terrible effort the Packers put forward at the Giants on Sunday. Still, I can’t justify picking against them here. The Vikings have terrible QB play and just aren’t performing well right now. Take the Packers. San Francisco at St. Louis - This one is simple. Take the 49ers. The only reason this one will be close is if the Niners don’t show up. That’s unfortunately possible, but hopefully not likely. Arizona at New York Jets - This is quite possibly the worst game of the season. Or at least it is the one I am least interested in watching. Total mess. Flip a coin. I’ll take the Jets since they are at home, but there is no way I could feel good about a pick in this one. Carolina at Kansas City - You can’t pick the Chiefs. You just can’t. Carolina looked solid on Monday night against a lousy team, so I’ll trust them here against an even lousier team. Take the Panthers. Indianapolis at Detroit - If you’d have asked me before the season started, I would have guessed that this would have been a very easy pick — the Lions by a landslide. Since then, though, the Colts have been a major surprise while the Lions have been a huge disappointment. Now I’m just confused. Take the Lions because they are at home. Jacksonville at Buffalo - Chad Henne has looked very good at quarterback for Jacksonville in the last two games, and I expect him to look very good again here. The Bills won’t have an answer for him, so this is a good spot for a mild gamble. Take the Jaguars. New England at Miami - Miami is coming off a solid win on the weekend, but they still aren’t playing particularly well overall The Patriots, on the other hand, have clearly been the best team in the league over the last month. Miami won’t be able to stop Brady and company, and they won’t be able to keep up on the scoreboard. Take the Patriots. Houston at Tennessee — If the Texans want to be a serious contender they have to make winning games like this look pretty easy. I think they are for real, so I’ll pick them confidently. Take Houston. Tampa Bay at Denver - It’s time for another gamble. The Broncos have looked vulnerable recently. The Bucs, meanwhile, have been playing very tough football, and they got very unlucky to lose last week. I think the superior effort will win here, and that will come from Tampa Bay. Take the Buccaneers. Pittsburgh at Baltimore - It took three accountants five hours to tally up all the turnovers the Steelers had last weekend. It was a mess of an effort. They likely won’t be that bad again, but they would need to be much better than they are currently capable of being to win this one. Take the Ravens. Cleveland at Oakland - Neither team is very good right now. Despite the location, though, there is more to like about the Browns, so they are my lukewarm pick. Take Cleveland. Cincinnati at San Diego - I really, really don’t like Marvin Lewis. It kills me, then, that I have been in a position to pick them four weeks in a row. They have served me well three straight weeks, though, so take the Bengals. Philadelphia at Dallas - Dallas is a frustrating mess of a team. Lucky for them, though, they look like the 1985 Bears compared to Philadelphia. The Eagles are so terrible that words can’t do them justice. Take the Cowboys. New York Giants at Washington - The Giants limped into last week, but they unleashed a remarkable performance against the Packers. They are far from consistent, though, and these Redskins are playing with all sorts of confidence. It’s time for another gamble — take the Redskins.